Crocus cartwrightianus (Crocus cartwrightianus): growing, planting, caring. A white-flowered species - and a parent of C. Sativus - the saffron species. Full description for Crocus cartwrightianus not yet available. Crocuses are sometimes confused with colchic! 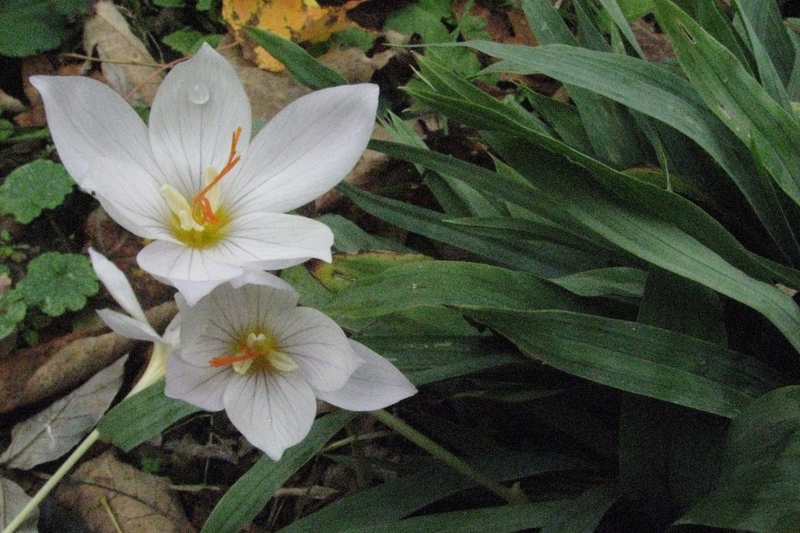 For most crocuses, which bloom in the spring, it is easy not to be wrong, since colchicum flowers in autumn. But for Crocus cartwrightianus - and besides his cousin with lilac flowers, Crocus sativus too - how to do? It's simple: the number of stamens differentiates them: 6 for colchics and 3 for crocuses. Voila. The white form of Crocus cartwrightianus is also often confused with C. hadriaticus, a white-flowered species native to the same regions. How to recognize them? C. hadriaticus has a style that divides above the throat of the flower and does not exceed half of the tepals, while C. cartwrightianus has a longer style that is already divided in the throat of the flower. Plant your white saffron crocuses in the summer for a flowering in autumn, in a sunny position, in groups of 3 bulbs, and spaced each 8 cm. Good to know: the earlier you plant, the more crocuses will enjoy the summer heat to start their life cycle ... so they will bloom early! The planting depth can vary between 10 and 20 centimeters depending on your climate: deeper in hot and dry zone, and less in wet zone - but never less than 10 or above 20! Water once at the plantation. At the emergence, water in case of prolonged drought. In the first year, watch for vegetation recovery, and water in case of drought. In cases where they are grown in pots, your crocuses may require weekly watering during dry periods. The multiplication of the crocus is done by dividing the bulbs during the period of dormancy, when flowers and leaves have faded. Separate the bulbils and replant them a few centimeters away. Be patient! You will need to harvest about 150 flowers to get one gram of the precious spice - and you will have to harvest every day during flowering! Harvesting occurs in autumn, from October to November, depending on the region and weather conditions: the flowers hatch when the morning temperatures drop below 10 ° C. The stigmas are ripe when they come out of the flower: cut them ideally every day, in the middle or late morning, when the dew has dissipated. Let them dry in the sun or twenty minutes in a barely hot oven (60 °C): this is your saffron! After flowering, do not cut the leaves: they allow the bulb to regenerate and produce each year 2 or 3 small bulblets that you can transplant elsewhere or leave in the same place - for more flowers!